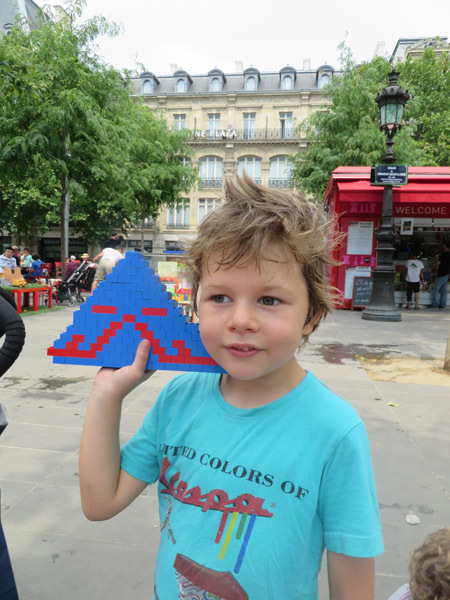 Paris is a city made for children. There are gorgeous little parks for all ages EVERYWHERE. They are usually lined with bench seats that actually face the play equipment and are fenced and clean. London needs to take a trip to Paris and learn how to do this! Our kids are little (2 and 6) so they needed to have some fun, burn energy and let their little bodies run around at least twice a day in order to keep them happy while we wandered through the streets. This was easy in Paris. Everywhere you go there is a little park. 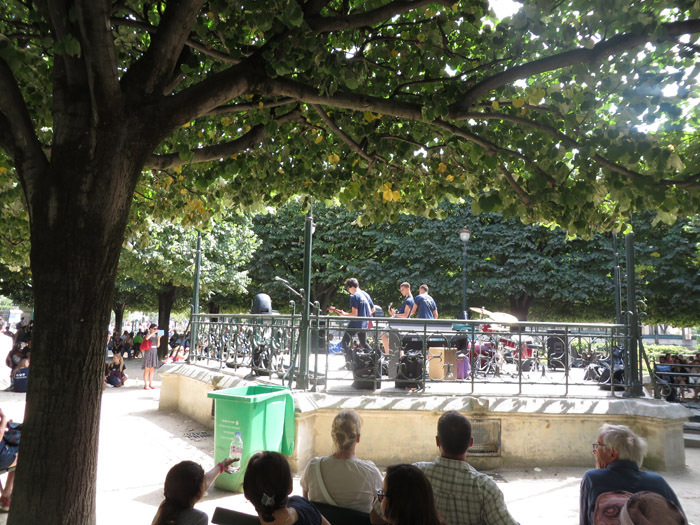 They are often close to restaurants and cafes so you can eat and watch your kids at the same time or get a take away baguette and sit in the park and have a picnic! As we are travelling for a long time we get sick of eating in restaurants all the time, so having a picnic each day was a wonderful treat for both us and the boys! Republik had the best community shop/toy kiosk I have ever come across. 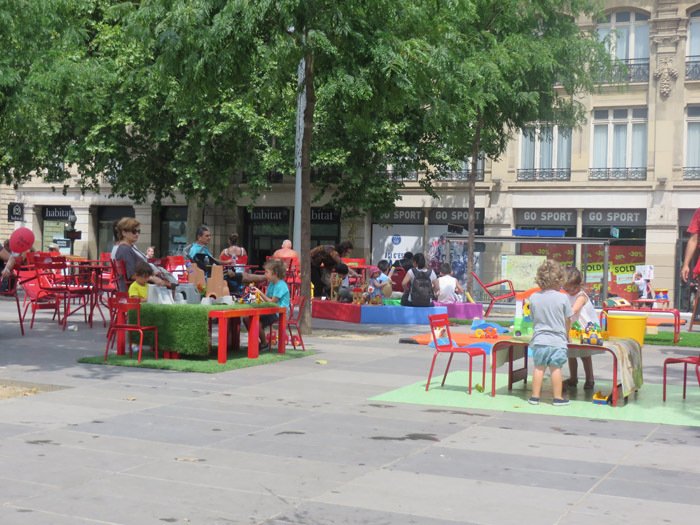 It is a huge square in the north-east of Paris and in the middle there was a kiosk where if you handed over a piece of ID (credit card, drivers licence) and gave them some details they let you pick out two kids toys to borrow for a few hours. You could exchange them as often as you wanted and the helpers were friendly and spoke English! I can’t recommend this play high enough for people with kids. As we are travelling lightly we are only carrying a few toys with us. The boys get two soft toys each (for bedtime) and there is a small pouch of cars, sea creatures and army figurines (thanks to the boys from the Edventure Project). On top of that we also have a small bag of Lego. Tom has to carry it all in his little back pack and if it doesn’t fit then it doesn’t come! The toy kiosk had Lego, mechanics, water play, blocks, bikes, scooters, jigsaws, games, toys, trucks. You name it – it was there! Tom picked Lego first (go figure!) and had a great time building towers and castles over and over again. 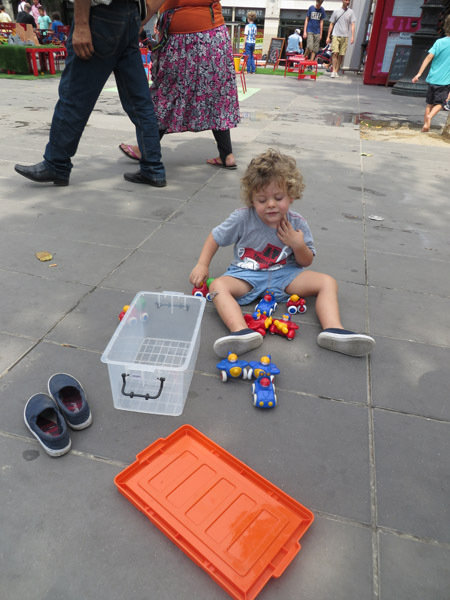 Milo picked little cars, trucks and planes to start!. You can see some of the play areas that are set up in the background. 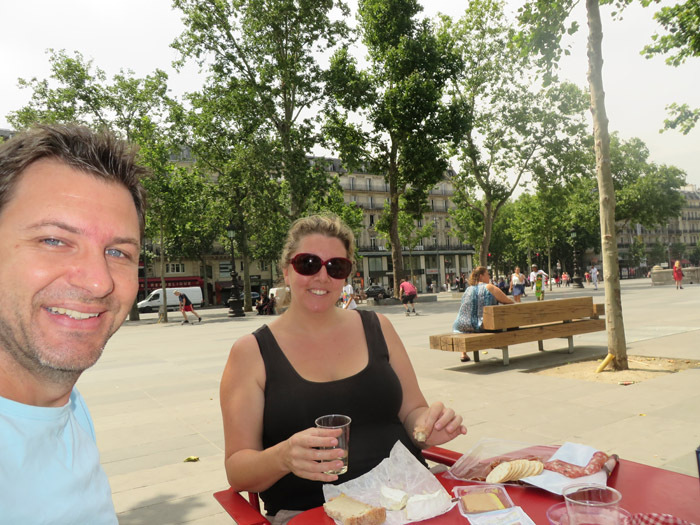 We stayed for nearly 4 hours and so Scott and I decided to have a picnic in the square. We grabbed a table, some wine, cheese, pate and meats and made lunch! It was so lovely to just sit and chat, have a glass of wine and watch the kids have fun with all their new finds! They also provided play tables for the kids with lots of toys (that you didn’t have to ‘check’ out) and the kids happily played for hours! 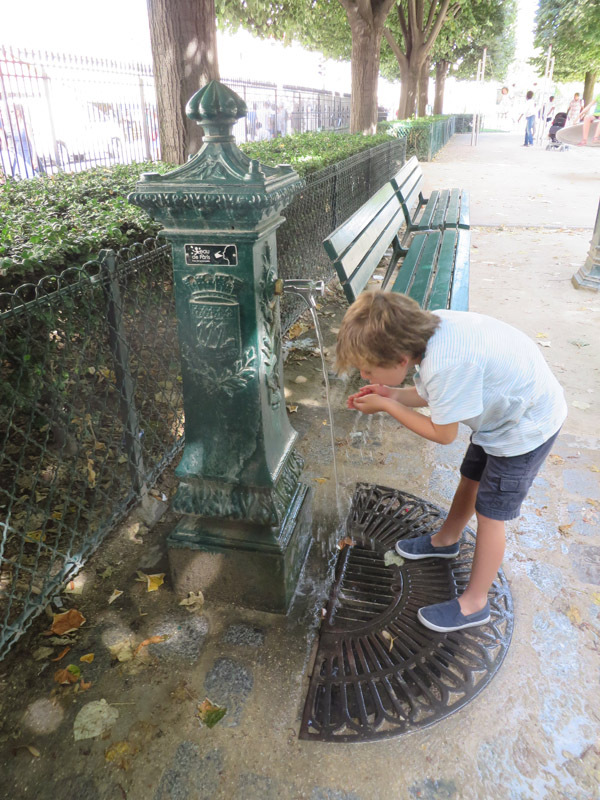 One of my favourite things about the city is the abundance of fresh, cool, clean water that is available. We only had to buy our first water bottles (for the bottle) at the beginning of our trip and then we re-filled them where ever we went. Coming from Bali where water bottle pollution is a huge problem (along with unsafe drinking water) this was a really great city attribute! They are one step closer to a bottle free city, like San Francisco! Of course the kids had lots of fun playing with the water! Daily Costs – NONE! All the parks and water are free! Even Republik! Wow, parks in Paris. I never really noticed the playgrounds when I was there on our honeymoon – but that was obviously pre-kids. Lou the Parks were awesome. Not too big, good equipment and benches (facing the park) in the shade. Plus all of them had a gate which is great when you have a runner like Milo. Republik was awesome. 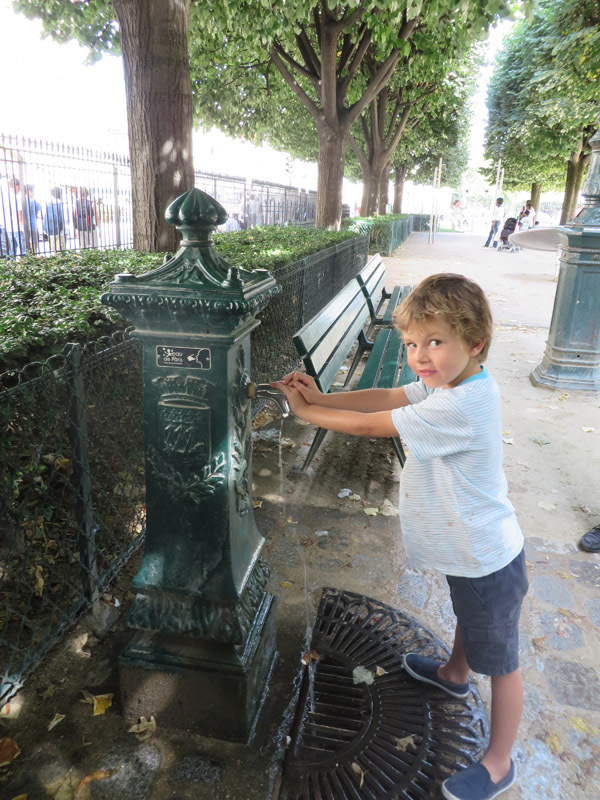 I would go back to Paris for a day just to take the kids there and let them go wild. It was like being in a toy shop and letting them open all the boxes …. and it was free! I really had no idea about these things in France. You have almost convinced me to give it another go. Haha well that would be a great achievement! I love the markets in France they are just gorgeous. Next time I’ll meet you there and show you what I am raving about and then you will love it! Interesting. Not to sound negative bc I love Paris but I do not think it is a city made for kids. Interesting to see swings though. 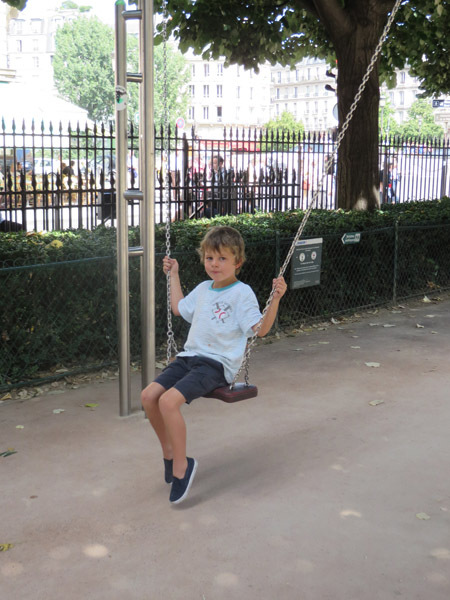 We didn’t find a single swing in any playgrounds we went to in south of France. We went to at least 6 or 7 of them. 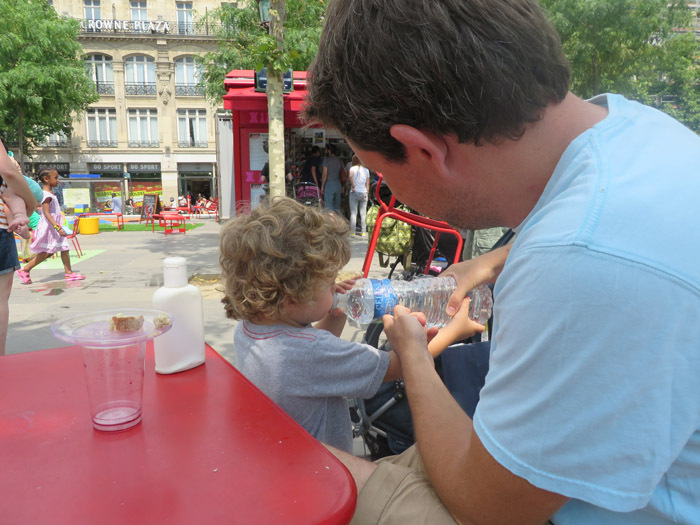 When I was in Paris with my 15 month old I actually hated how there is no accommodation for young kids. No changing tables, no high chairs and the only cool playground we found charged money. Also the bathrooms on playgrounds charged money perhaps they have changed their ways since 3 years ago I do agree with your comment on water. It is the same throughout France. The most South we went was Grenoble and there were lots of good playgrounds there as well, but we didn’t get down to Nice or Province this time around. I was quite shocked at how lovely the playgrounds were (we had come from London where they were few and far between and definitely not for toddlers. I think paying for toilets is terrible. We managed to find an apartment on Air BnB as well but my boys don’t need a cot anymore so it was fine for us and we had lots of options. I know! It was awesome! I am not sure how old your sister’s kids are but the Metro is a nightmare for prams, so if she wants to avoid it then it would be best to stay in the middle of the city so she can walk everywhere! Love the pic of Milo – what an angel face ! Haha I know it is not the most child-friendly city. The Metro is a nightmare with a pram! However we were really surprised at how easy it was to walk around with the kids and keep them entertained in little bursts by taking them to 2 or 3 parks a day. Oh wow those parks look amazing. I love the play tables especially. You are making me even more keen to hit up Europe next year. Thanks! It is just so lovely. The food is awesome and so easy to walk around all day! I love Paris! I’ve only visited pre-children so can’t wait to go back and explore with the kids. It certainly is a different city with kids. I won’t lie though … the underground is hard with kids in prams, hence we walked everywhere. However it is such a beautiful city to just walk around and get lost in, and it is even better when you can entertain the little ones with great parks and activities!